WASHINGTON, DC – Vote Hemp, the nation’s leading grassroots hemp advocacy organization working to change state and federal laws to allow commercial hemp farming, has released final estimates of the size of the 2017 U.S. retail market for hemp products. 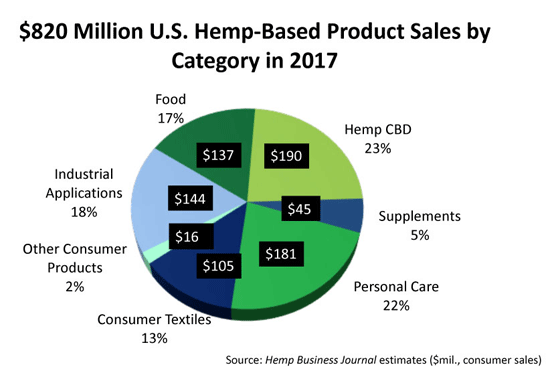 Data from market research by Hemp Business Journal supports an estimate of total retail sales of hemp food, supplements and body care products in the United States at $553 million. 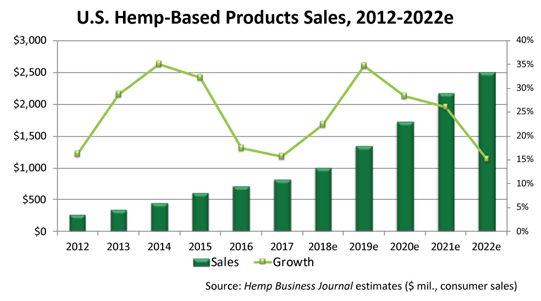 Sales of popular hemp items like non-dairy milk, shelled seed, soaps and lotions have continued to increase, complemented by successful hemp cultivation pilot programs in several states, and increasing grassroots pressure to allow hemp to be grown domestically on a commercial scale once again for U.S. processors and manufacturers. Hemp Business Journal has also reviewed sales of clothing, auto parts, building materials and various other products, and estimates the total retail value of hemp products sold in the U.S. in 2017 to be at least $820 million. Of this $820 million hemp market, Hemp Business Journal estimates that hemp foods constituted 17% ($137 million); personal care products constituted 22% ($181 million); textiles constituted 13% ($105 million); supplements constituted 5% ($45 million); hemp derived cannabidiol or CBD products constituted 23% ($190 million), and consumer textiles constituted 13% ($105 million); industrial applications such as car parts constituted 18% ($144 million); and other consumer products such as paper and construction materials accounted for the remaining 2% ($16 million) of the market. Data was gathered and analyzed by the Hemp Business Journal, the leading provider of market intelligence to the hemp industry (www.HempBizJournal.com). In addition to this information on the 2017 hemp market in the U.S., Hemp Business Journal has further produced estimates on the growth of the hemp market, which it expects to reach $1.9 billion in the U.S. by 2022. “As the U.S. hemp market continues to grow at a double digit pace annually, American consumers continue to demonstrate their strong interest in hemp products,” said Eric Steenstra, President of Vote Hemp. “We expect the rate of growth of the market to increase, as Congress has indicated its intention to finally lift federal prohibition on industrial hemp farming. Few other industries can so clearly prove the market demand for their products, whereas the hemp market has essentially tripled in the last 5 years as hemp farming advocates have made advancements in legalizing the crop at the state and federal levels,” he continued. On April 12, 2018, Senate Leader Mitch MConnell (R-KY) with strong bi-partisan support from Senator Ron Wyden (D-OR), and further support from Senator Jeff Merkley (D-OR), introduced The Hemp Farming Act of 2018. If passed, the bill would place federal regulatory authority of hemp solely with USDA and require State departments of agriculture to file their hemp program plans with USDA but allow them to regulate hemp cultivation per their State specific programs. In addition to defining hemp as cannabis that contains no more than 0.3% THC by dry weight, the bill asserts a ‘whole plant’ definition of hemp, including plant extracts; and would remove roadblocks to the rapidly growing hemp industry in the U.S., notably by authorizing and encouraging access to federal research funding for hemp, and remove restrictions on banking, water rights, and other regulatory roadblocks the hemp industry currently faces. The bill would also explicitly authorize crop insurance for hemp. To date, forty states have defined industrial hemp as distinct and removed barriers to its production. These states are able to take immediate advantage of the industrial hemp research and pilot program provision, Section 7606 of the Farm Bill: Alabama, Alaska, Arizona, Arkansas, California, Colorado, Connecticut, Delaware, Florida, Hawaii, Illinois, Indiana, Kansas, Kentucky, Maine, Maryland, Massachusetts, Michigan, Minnesota, Missouri, Montana, Nebraska, Nevada, New Mexico, New Hampshire, New York, North Carolina, North Dakota, Oklahoma, Oregon, Pennsylvania, Rhode Island, South Carolina, Tennessee, Utah, Vermont, Virginia, Washington, West Virginia and Wyoming. Vote Hemp is a national non-profit organization dedicated to the acceptance of and a free market for industrial hemp and to changes in current law to allow U.S. farmers to once again grow hemp commercially.